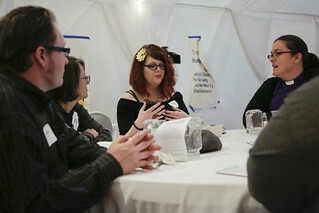 On March 29, nearly a 150 people from across Kentucky and central Appalachia gathered in Harlan County for a community conversation with each other and with Rev. Dr. William J. Barber II and Rev. Dr. Liz Theoharis, as part of the national listening tour of the Poor People’s Campaign: A National Call for Moral Revival. Rev. Barber and Rev. 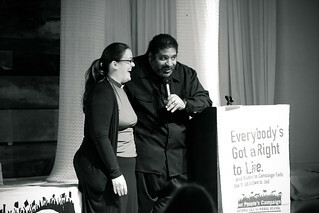 Theoharis are the co-chairs for the Poor People’s Campaign: A National Call for Moral Revival, which is a multiyear campaign to build power among the poorest and most powerless communities. 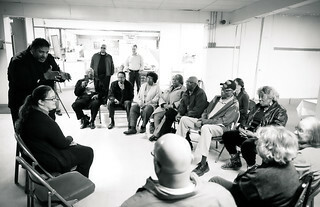 For the last several months they have been on a listening tour, visiting with communities around the country where people are organizing to address issues related to poverty, racism, ecological devastation, and the war economy. The day began with a visit to the East Kentucky Social Club in Lynch where local residents shared some of the history of Lynch and neighboring Benham, where, in its peak, ten thousand people lived and dozens of languages were spoken by immigrants who had come to work in the mines. But as the coal industry declined, so did the number of folks living in their community, especially young folks. “When you have to leave your whole culture, your home – this is not right. We are going to make a better world for all of us, so it doesn’t have to be that young people can’t be here any more,” said Rev. Theoharis. Community conversations continued down the road at the Benham Schoolhouse Inn where tables of folks shared their stories of struggle and of organizing, but also how they are seeing folks taking action to advance justice and protect what matters. Some highlights included the role of arts and culture and plays produced by Higher Ground in Harlan County, using stories and leaderless conversations to respond to racism, and the connections being made and conversations happening that day. 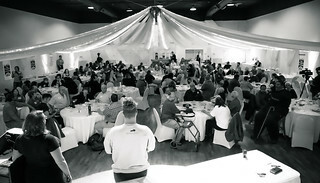 Reports from the table conversations highlighted how many of the issues people are facing in their communities are interconnected issues. Tanya Turner, one of the emcees for the afternoon, shared how issues of poverty and economic injustice cuts across many lines of difference. After the table conversations and report backs, Rev. Barber shared the interconnected injustices that the Poor People’s Campaign: A National Call for Moral Revival are focused on throughout their listening tour: systemic racism, systemic poverty, ecological devastation and the war economy. These issues, according to Rev. Barber, are doing the greatest harm to the foundation of democracy. Threats to our democracy also come in the form of voter suppression laws. The Poor People’s Campaign estimates that since 2010, twenty-three states, including Kentucky, have passed voter suppression laws. Those same states have the highest poverty rates, highest rates of poverty among women and children, they don’t have living wages, and they’re anti-union. “Being poor isn’t a sin. Systems that keep people in poverty are a sin,” said Rev. Barber. To address these systemic issues, thirty-nine states, including Kentucky, have state coordinating committees to launch a multi-year movement that begins on May 13 with forty days of organizing and nonviolent direct action, where folks will engage in voter education, civic engagement, movement building and building power from the ground up. Then on June 23, there will be a major mobilization in Washington, D.C. where folks from around the country will stand up for a just and moral political agenda, including a living wage, health care, housing, the right to organize, and more. If you would like to get involved with the Poor People’s Campaign: A National Call for Moral Revival, please contact KFTC organizer apprentice Tayna Fogle (tayna@kftc.org), who currently serves as one of the tri-chairs of the Kentucky coordinating committee with the Poor People's Campaign: A National Call for a Moral Revival.